Everybody loves Nutella. It's creamy, sweet, and is packed with calories. Not the best choice for dieting. There is a healthier option - a homemade spread similar to Nutella, actually much nicer and an excellent choice for a bit of fuel to start off a long ride/run. 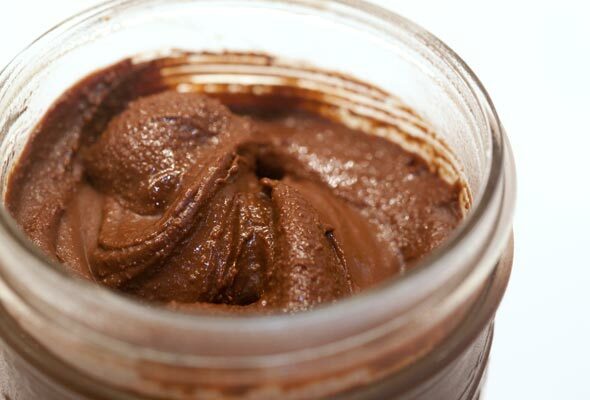 Before starting, note that your homemade Nutella will have a chunky texture compared to the store bought one. This is simply because nobody has industrial grade blenders/food processors at home. But the taste is much lighter and more fun. Hint about the cocoa powder vs cocoa beans: cocoa beans carry the cocoa oils and aroma of a fine dark chocolate with them. Cocoa powder has been dried and all the cocoa oils extracted from it. The flavor of powdered cocoa beans is worlds away from the cocoa powder. Peel the brown skin shell of the cocoa beans, you want only the dark, almost black center. The skin shell is dry - to remove it squash a few cocoa beans against each other in your fist. This will crack the shell and make it easier for you to remove it. Put the peeled cocoa beans in a powerful blender or a coffee grinder and pulverize them - as fine as you can. The cocoa beans will release oils as they are ground, so at the end you'll end up with sort of a fine paste. Stop grinding when the paste forms, otherwise the blender motor will overheat. Combine the blended cocoa and hazelnuts in one blender. Add the honey, coconut milk, rum and salt. Blend well. Put it in a container and keep it in the fridge. Enjoy! Final Hint - For best taste, let the mix rest for an hour before tasting - this will allow all the flavors to combine with each other. Is it better than the store bought? Tell us in the comments!